The Real Story: An Investigation or a Witchhunt? Symington told the Arizona Capitol Times that while he’s interested in the prospect, he’s also torn because he has grown comfortable being out of the political spotlight. But Symington says he is encouraged by the idea that he might get a chance to run against former Attorney General Grant Woods. 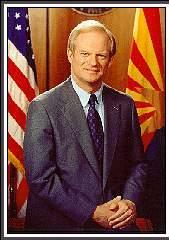 John Fife Symington III served as the 19th Governor of Arizona from 1991-1997.